Rolling out the plastic to lay up along the west wall, before covering it with pebbles. That will run all rain water away from the house and into the drain. September was a month of hard work, visits and glorious weather. Our new fly swatter came in very handy one night! Perry's mum, Rhona, came for the first time and enjoyed a week of painting, jam making and country walks. Fig chutney, fig jam, pickled onions, quince jelly, home-made bread. We're becoming more self sufficient. But first you have to pick the things! The Couleuvre. 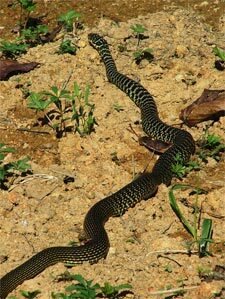 He lives in the porcherie and is about 2 metres (6 ft) long. He's not poisonous, Phew! 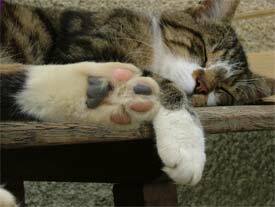 Maow, the neighbour's cat, feels right at home with us. We have to chuck him out every night before we go to bed. 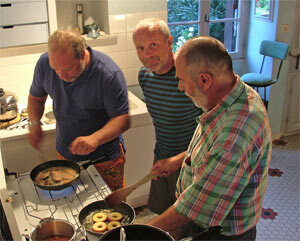 Three grey-bearded men cooking fresh foie gras. Perry's friends, Austyn and David, came for a few days of work and play. 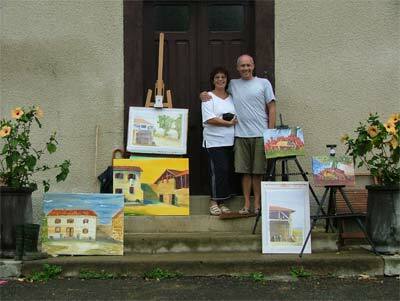 Tom and Marja drop by for fig tart and tea whilst on holiday near Pau. The first hint that summer was coming to an end. Christian, the farmer who works some of our land, came to plough what will become our vegetable garden. The drainage trenches were finally all filled in and after a heavy rain storm, we discovered that the pond fills up too! A month of mud and the grass began to grow back. 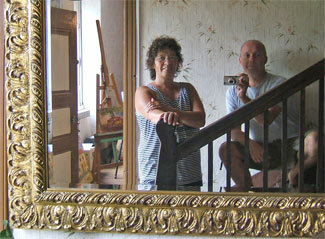 Perry's Mother, Rhona, came for a week of painting, relaxing and to see our house for the first time. In between the aquarelle, acrylic and oil painting sessions, we made jam, chutney and her own recipe for spicy pickled onions. 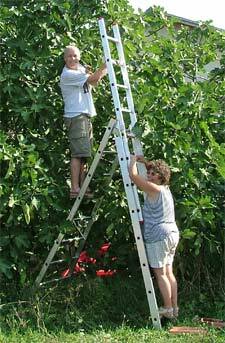 The fig tree next to the house attracts an enormous amount of insects, including some king-sized hornets. Late one night, while closing the shutters, several flew into the house. Perry had just bought a couple of fly swats that came in very handy, even though it took him an hour to get them all. Meanwhile Mum and Caroline went to bed. Caroline called for Perry to come upstairs. there he found her cowering behind the mosquito net as a couple of these angry beasts circled her. Swinging wildly while clambering over the mattress, several other hornets were trying to squeeze in past the mosquito netting in the window, buzzing loudly. It was rather like a scene out of the Hitchcock film, The Birds. An hour later, our valiant hero slipped under the covers with swatter's elbow. We have been hearing crunching sounds in the chai, (the large room at the back of the house that was used for storing wine). Further investigation uncovered sawdust, holes and a large collection of Capricorn larva. 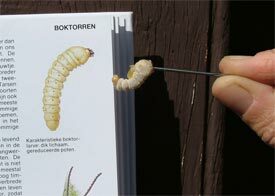 They hatch into beetles, but for up to seven years they chew wood. In this case, our beams. Caroline joined our artisans in removing the affected wood and unusually, managed to pluck out the chap on the left. They won't bring a house down, like a termite, since they can't eat the hard heart of oak, but enjoy the softer flesh. 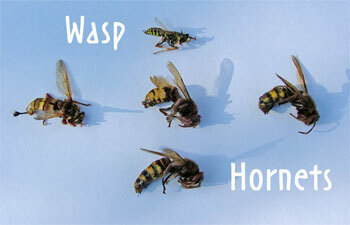 A course of Xylophene, an anti-bug, anti-rot spirit, normally does the trick. Find out more in the Our House section. We have a quince tree. Hard yellow, pear-like fruit with a soft, downy fur that falls off when ripe. Caroline spent hours making a jam based on one of Rhona's recipes. Delicious. 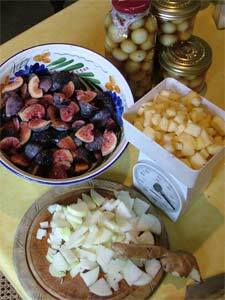 Meanwhile Perry took a week out and enjoyed picking figs and making chutney with his mum. Quality time. Rhona challenged Perry to give her painting lessons, just like he would have to do if he ever started painting holidays. She's a tough audience too. Three days later they had both learnt a lot and caught up on all the family stories. While walking near the Porcherie (the old pig sty) Caroline saw something move in the corner of her eye. It turned out to be our resident snake, sunning himself. Returning with the camera, she realised that he was longer than she was. Not many mice left in the porcherie, me thinks. Good job Perry didn't see it. One of Perry's old friends, Austyn, asked him to design a brochure. 100 pages showcasing cottages in West Cornwall. The job entailed a 'studio visit', so Austyn, accompanied by another old friend David, came for two days of briefing, brainstorming, eating and drinking. To this end, they visited the local markets and producers for delicious beef, cheeses, wine and fresh foie gras. Their visit was topped off by a gourmand meal at the Auberge du Lac, a local highlight, just a kilometer from our beds. 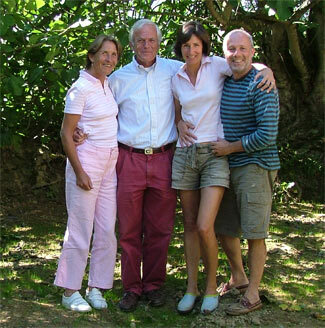 At the same moment we received a telephone call from Tom and Marja Schlatmann, who were staying in Les Landes. (Tom was a colleague of Caroline's father.) They came by for coffee and a slice of Caroline's orgasmic fig tart. We look forward to having them come and stay just a little longer next time. Every day towards the end of September we see them gathering. Swallows, swifts and House martins all preparing for the coldest leg of their migratory journey, over the Pyrénées. 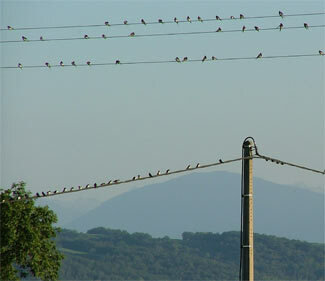 Each evening as we sat outside for dinner, they filled the telegraph lines, twittering in anticipation. As they leave, the robins, chiff chaffs and grey cranes take their place. The cranes often circling over the house on thermals before descending to the lake. in preparation for next year, we have started our vegetable garden. As a big helping hand, our Farmer, Christian, ploughed open a part of the meadow in front of the house. 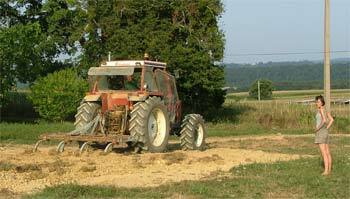 We can now mix in manure and let it settle in before the spring. I can taste those beans, peppers and rasberries already!